March is coming like a lion in Edmonton! Here’s some of what is going on at Expressions Orthodontics. Running Room recently featured how Dr. Sunny and Misaki met in the company’s running magazine. Read how the pair connected through their love of running. Invisalign is an alternative to braces for orthodontic treatments in Edmonton.We offer Invisalign treatments that consist of wearing a series of semi-invisible and removable aligners that move your teeth until they reach the final position. The emotional, physical, and cognitive effects of music are well documented. All the science aside, when our Edmonton orthodontic patient Jessica Dunford wrote and performed a song dedicated to Dr. Sunny and our team — well, we were floored. With Jessica's permission we put her song behind all the smiles we've helped create! We hope you enjoy this thank you as much as we did! October 23, 2017 was a great night for Dr. Sunny Leong and his Orthodontic team. 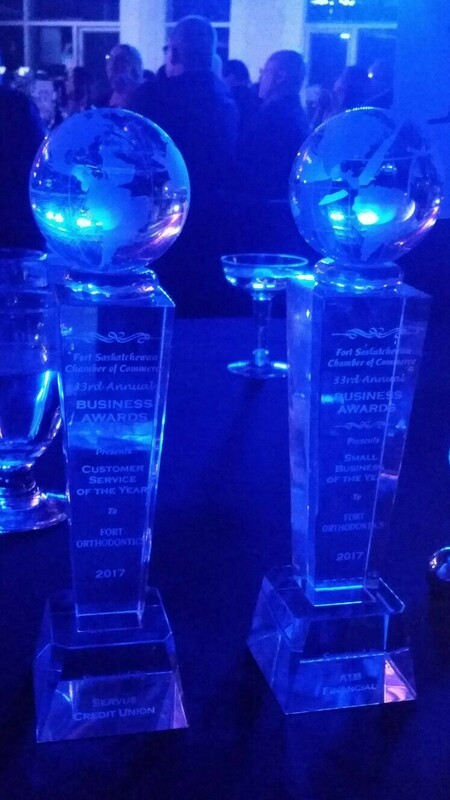 They were awarded not one but two BEST awards by The Fort Saskatchewan Chamber of Commerce. This award is given to a privately owned business (1-50 employees) that best reflects the outstanding spirit and success of the small business community in Fort Saskatchewan, demonstrating excellence in client service, human resources, sales & marketing. The business must have been operating for at least 2 years. This award is presented to a business that has consistently offered exemplary customer service; often going over and above the typical expectations of their industry/sector. Sunny accepts the Small Business and Customer Service awards during the 33rd annual Fort Saskatchewan Chamber of Commerce Business Awards on Oct. 20. “I feel like I just won the Stanley Cup. I feel like I’m Connor McDavid and I’m lifting the Stanley Cup. It’s amazing. The Customer Service Award is the best award that I’ve had in my life,” said orthodontist and owner Sunny Leong. Fort Orthodontics, our sister location, has been operating in Fort Saskatchewan for eight years. See our commitment to service for yourself! Contact us for your orthodontic evaluation or treatment. Got My Braces Off Song -- ????? We received an 'extra special thank you' from Jessica Dunford who just got her braces off. Jessica is a local singer/songwriter (like Dr. Sunny) and she produced a song about her experience at our office and the magic of her smile. Exciting News — Dr.Leong just recently got engaged! This photo was taken moments after Misaki said Yes! Misaki is currently working at the University of Alberta on her PhD in animal nutrition. Dr. Sunny & Misaki enjoy running marathons together, cheering on the Edmonton Oilers, & laughing together daily!! Congratulations from all the staff at Expressions Orthodontics to this beautiful couple on their engagement! Join us at Expressions Ortho for BBQ and music on Saturday June 6th from 11-2pm. M and M will be selling hotdogs and hamburgers, pop and chips for $5. All moneys raised will go towards Dr. Sunny Leong's Kindness in Action mission planned for next year. Dr. Sunny will be jamming with his band for musical entertainment. Contact us for more details!